Add a rear view camera to your factory head unit! 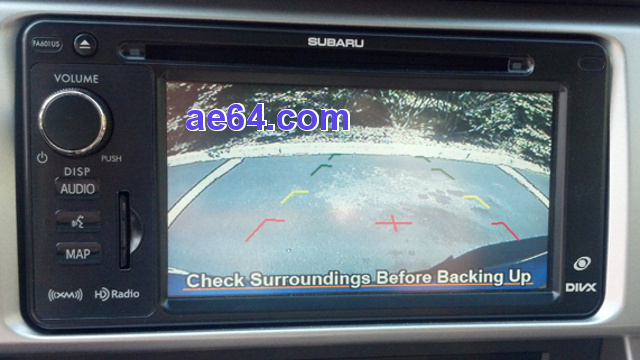 Many 2012-up Subaru and Toyota factory head units with built-in navigation or video screen have a 16-pin socket for a rear camera. 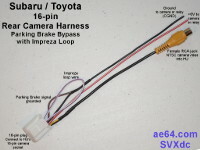 Most are already wired to the reverse gear signal, and will begin automatically displaying the camera image after you add this harness and connect a camera. 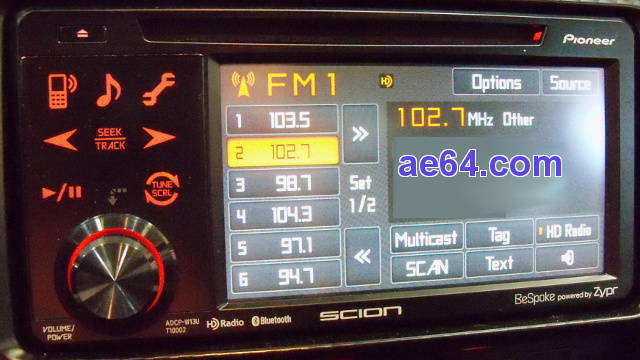 2012-2016 FR-S Toyota OEM Panasonic TAS300 "Touch"
If you haven't already, please see this page with information about the OEM head unit's rear camera function on HUs with the 16-pin socket: Toyota/Subaru rear camera operation. Unsure whether your OEM HU is compatible? Contact me via e-mail and tell me your car's year and model, and your HU's model number (find the model number printed on the front). If it's one I'm not familiar with, I may ask you to send pictures (but often I've been able to find them on the 'net by searching for the model number). In many other Subaru models/years (including those with OEM Kenwood navigation) the OEM HU has an 8-pin socket for the camera input. 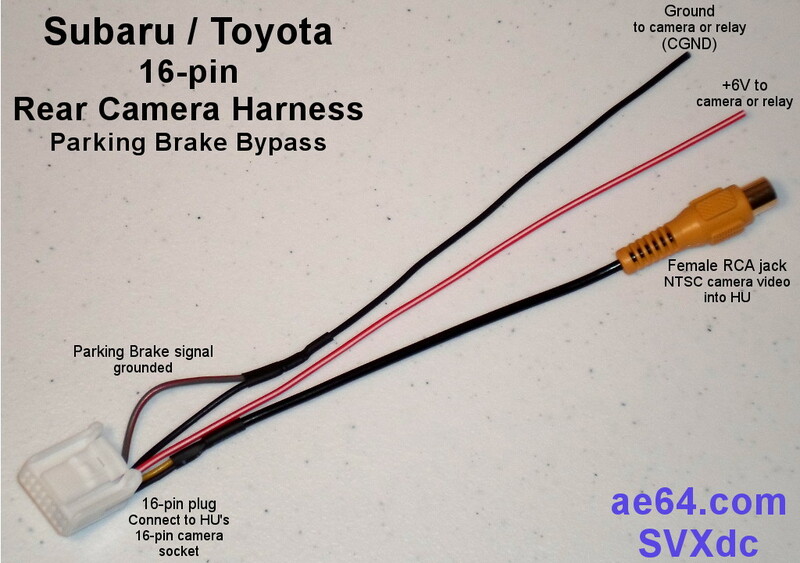 See this 8-pin camera harness. 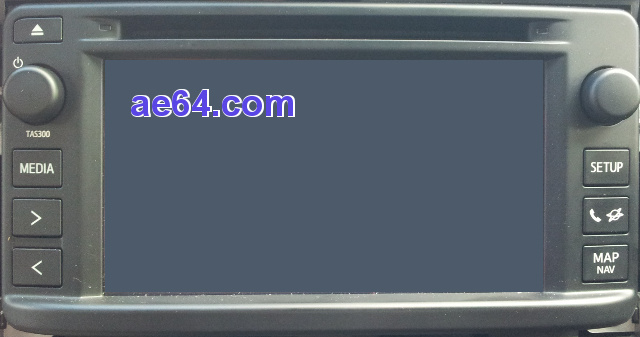 Do you have a car with an OEM camera and whose OEM HU has the 16-pin or 8-pin camera socket, and you're planning to switch to an aftermarket HU? Ask me about my rear camera retention harnesses. 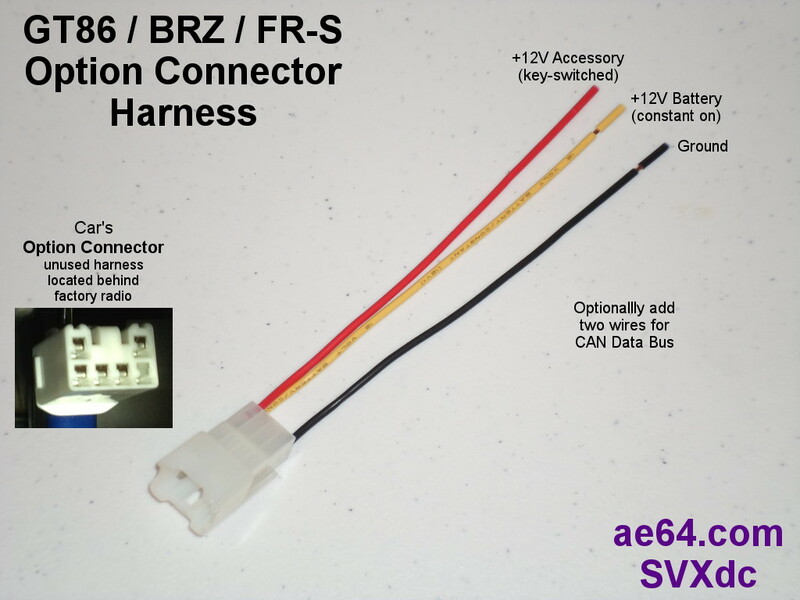 You do not need any of these harnesses to add an aftermarket camera to an aftermarket HU. If your car is a BRZ that was originally sold outside of North America, or a Toyota model, you must check whether your HU has the car's reverse gear signal connected and functional. See my 'rear camera operation' page for details. 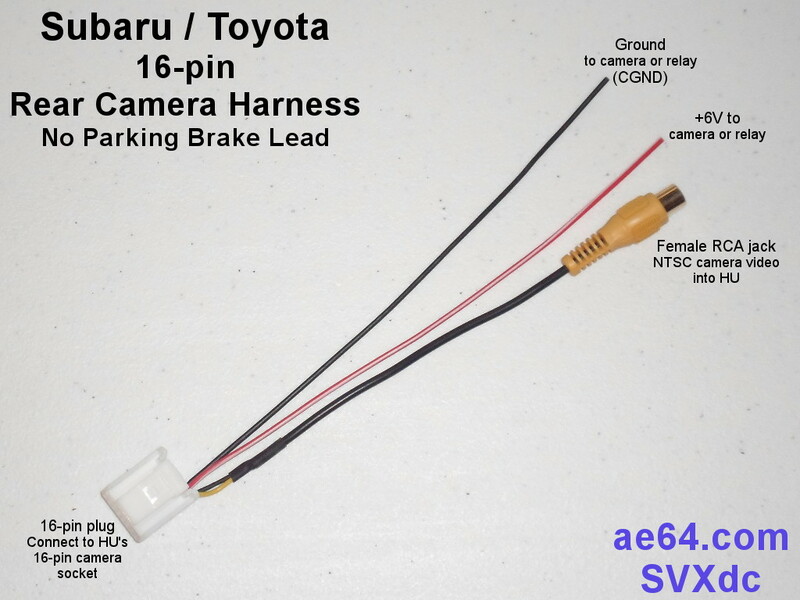 If your HU lacks the reverse gear signal, I can probably supply a wire with the proper OEM-style (Japanese) terminal which you can easily add to your car's 28-pin harness. 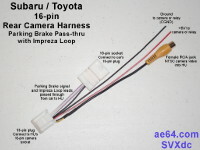 Price is an additional $2 or $4, limit one wire per 16-pin camera harness. E-mail me for details, and tell me your car's year/model and the model number on the front of your OEM HU. 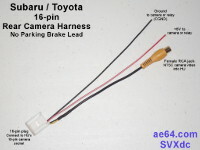 All versions of my 16-pin camera harness now include the 6V and CGND leads, which are approximately 7.5" (190 mm) long. Use those to provide the power and ground to your camera or a relay. A. "Bypass" version (pictured at the top of this page). 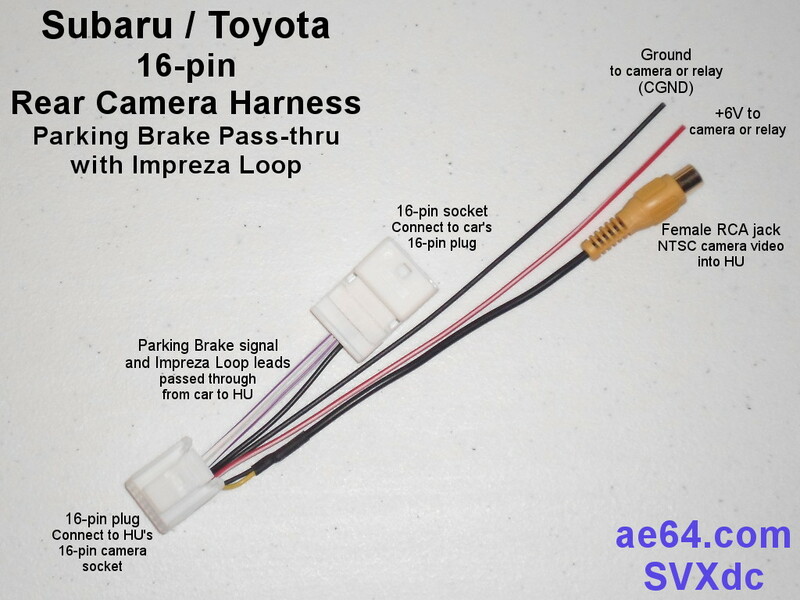 Harness simply grounds the HU's parking brake input. Most people choose this configuration. Price $24. B. "Pass-thru" version. 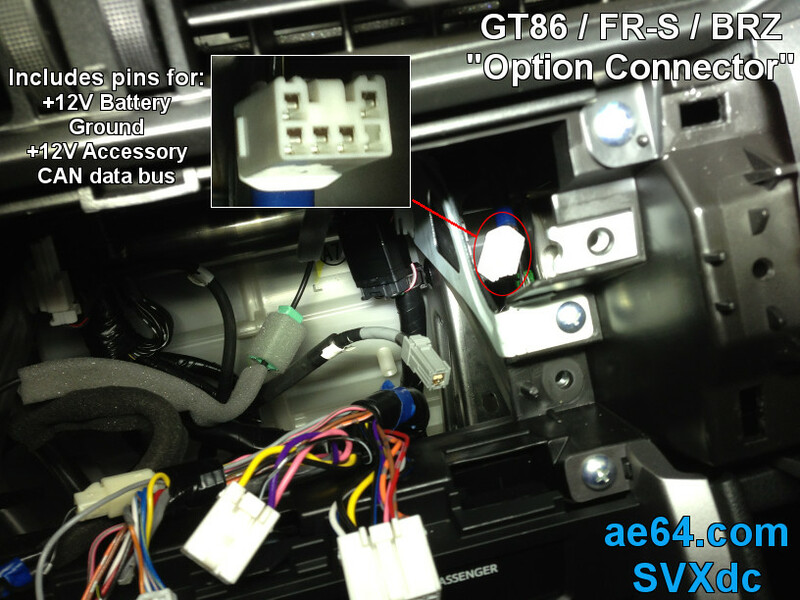 This configuration has an additional 16-pin socket, to connect to your car's factory 16-pin harness and pass through the car's parking brake signal to the HU. Price $33. C. "No parking brake". 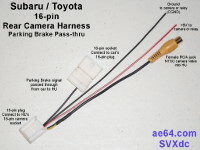 Only for some models that do not have a factory 16-pin harness (in other words, when the OEM HU does not have or need the parking brake signal connected). Price $23. See my 'rear camera operation' page for more information and why you probably should choose the less-expensive "bypass" version. 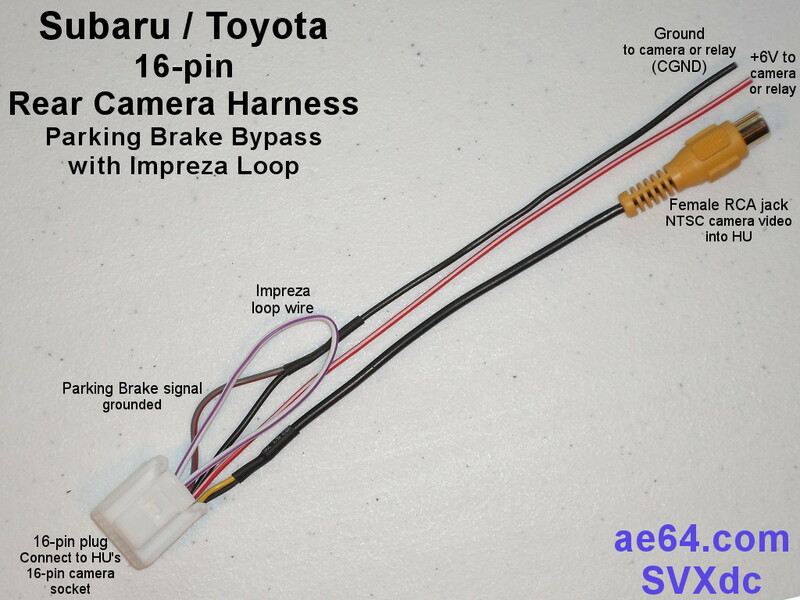 Some Subaru Impreza, WRX, and STi models have a wire looped between pins 4 and 5 on the factory 16-pin harness. Since I don't know what purpose that wire serves, I must include a similar wire on my camera harness if you have one of those models. Add $1 to the "bypass" version, or $2 to the "pass-thru" version. 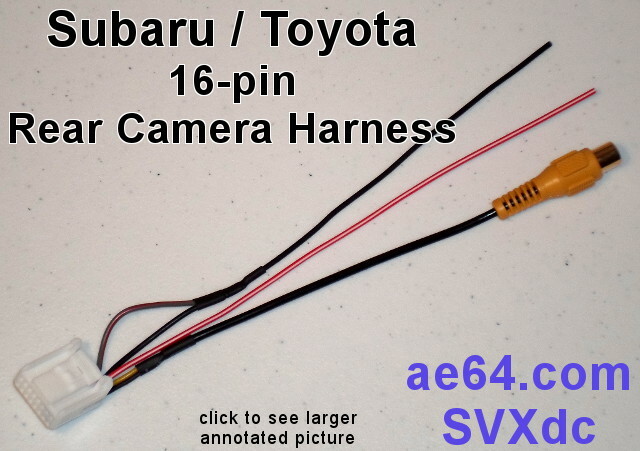 I'm not aware of any Subaru or Toyota models using any pins on the 16-pin camera harness other than those that I include on my harness (documented on the 'rear camera operation' page). 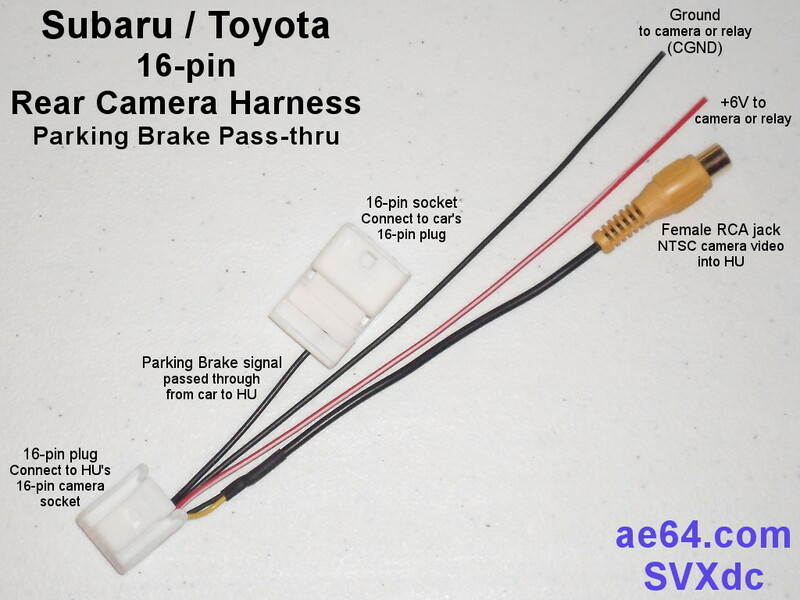 If your car has a factory 16-pin camera harness with wires on other pins, let me know so we can determine the purpose of the wires (and I would greatly appreciate pictures). Otherwise, as a rule I do not supply loose terminals or extra wires with terminals, since they are somewhat difficult to obtain and not inexpensive. On top of that, each different type of terminal requires a unique and very expensive tool to crimp properly. A generic crimper that you can buy at a hardware or auto parts store won't work. If the crimp is not shaped exactly right, the terminal won't lock into the plastic housing and may prevent you from closing the retention latch (which in turn will prevent you from plugging the plug into the HU's socket). 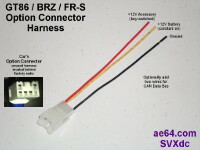 For BRZ, FR-S, and GT86 models: This 6-pin harness connects to the car's "Option Connector" and has leads for +12V Battery, +12V Accessory, and ground. If your camera requires more than 6V, use this harness to avoid needing to splice into a factory wire for power. Can also be used to power a Dash Camera or other accessories. Price $4.